I’ve been contemplating this mission for over two years. 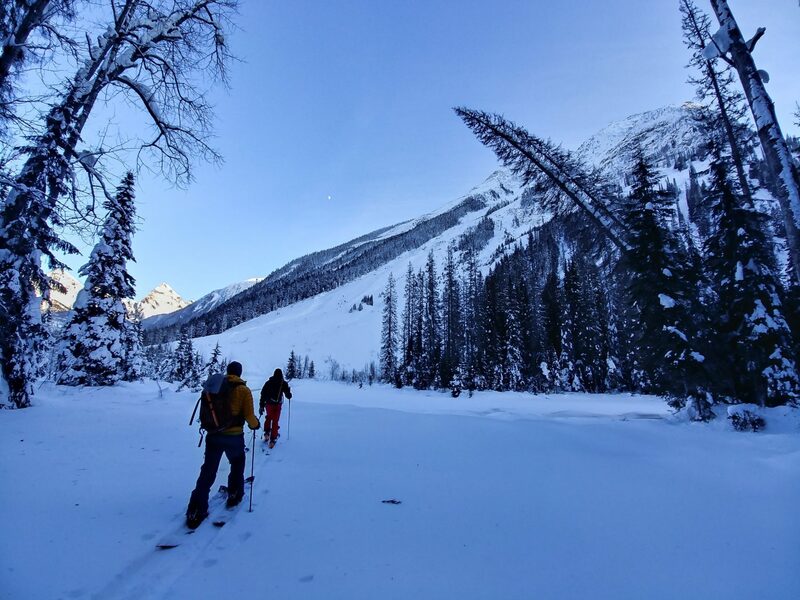 Laurent (@laurent.saulnier), Inuk (@inuk_morissette) and I ventured into the Rogers Pass Loop Brook area with one objective in mind: skiing off Mt Green’s Summit. From the top of its 2692m, this behemoth of a mountain towers over the Trans-Canadian Highway. 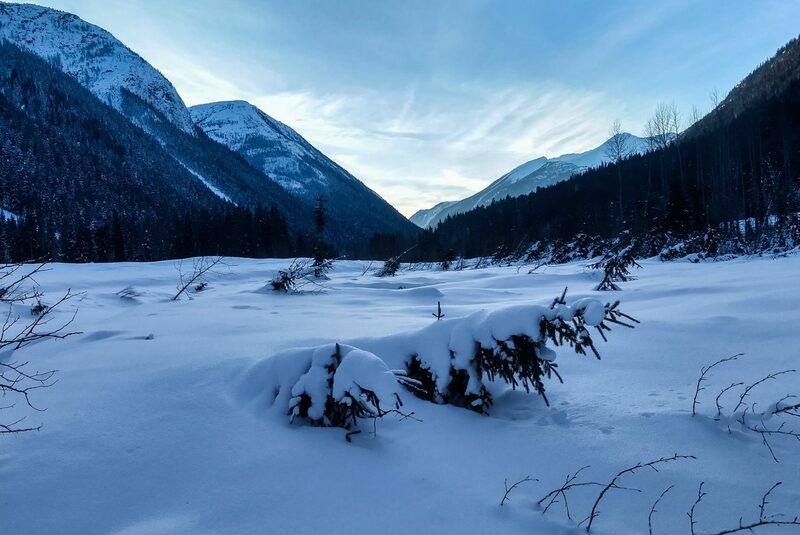 Due to its enormous size, the valley below rarely sees the sun during the frigid Canadian winter. The weather was outstanding. 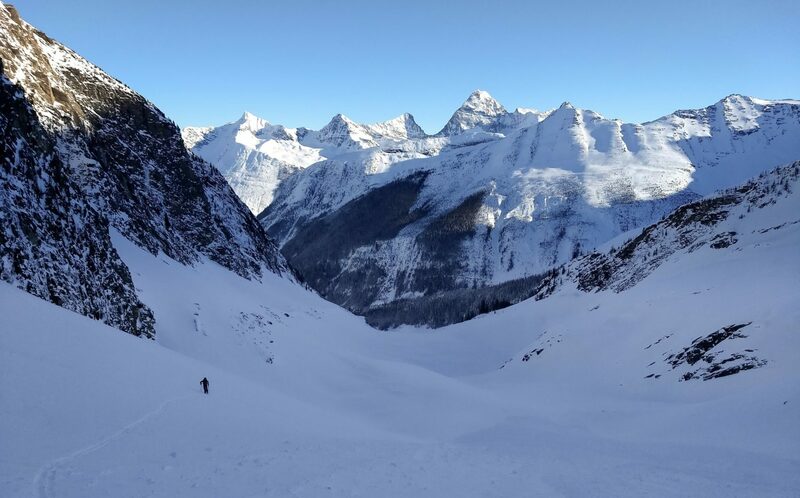 Bluebird day, alpine temperatures at -1C, low winds, and a consolidating snowpack. We couldn’t have asked for a better day. Beginning in the Loop Brook parking lot at 6:45 AM, we organized our heavy packs eager to start our day. A cool glacial draft was blowing through the valley. Fifteen minutes later, we got the green light from Parks Canada that the Winter Restricted Area was open. We clicked in our bindings and disappeared in the forest ahead. We navigated along the Loop Brook drainage with care, paying close attention to the hazards on both sides. 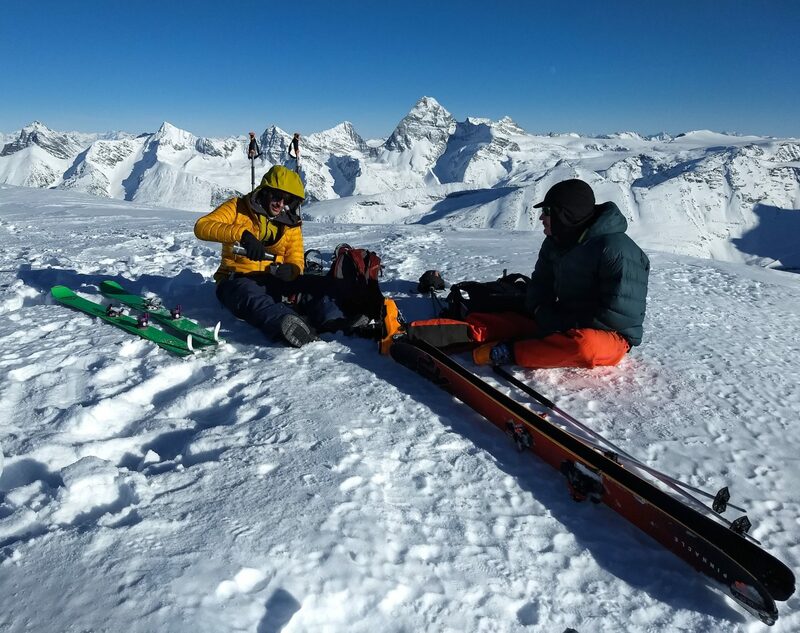 The near-zero temperatures coupled with direct sun exposure could trigger a wet slab avalanche on the south aspects. 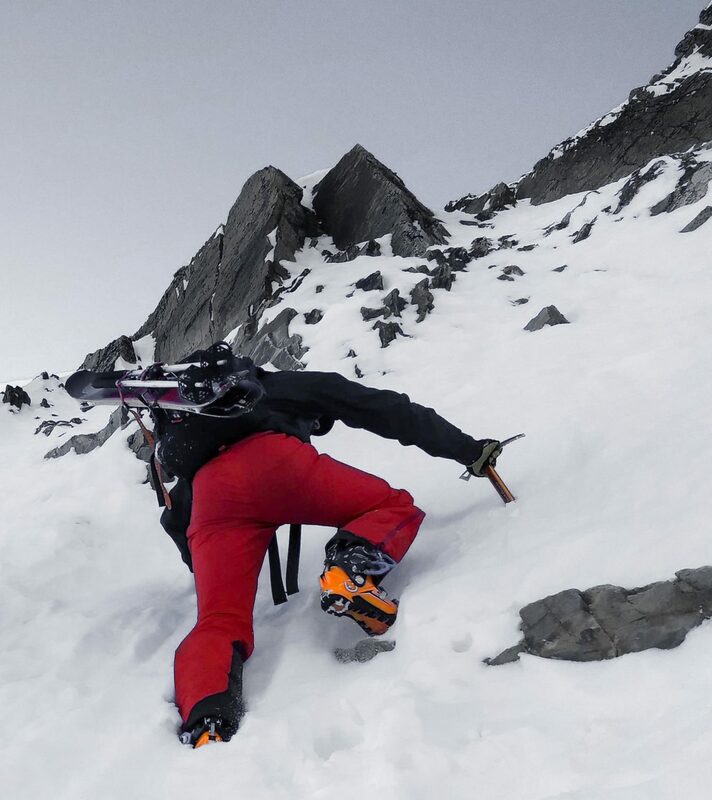 At the same time, the solar-heated cornices could fracture, which would cause an avalanche on the wind-loaded north face. At 1800m, we felt very exposed. The valley was narrowing as we approached Ross Pass. On the right, we saw evidence of wet sloughing from yesterday. On the left, massive cornices on Mt Parson, overlooking the valley. We sprinted across the 500m section, panting heavily as we arrived below the col where most of the elevation would be gained. 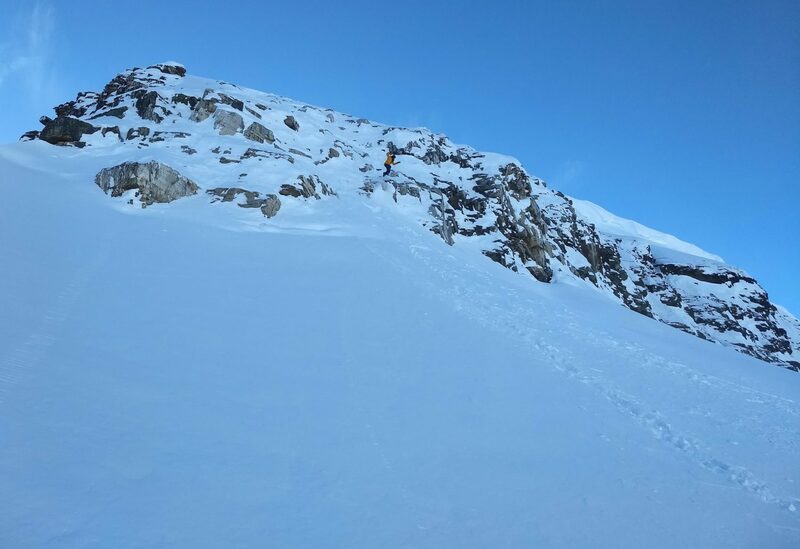 As we closed the distance, we noticed an avalanche crown at the col, spanning most of its width. This meant one thing. The unstable wind-pocket had already cleaned up the face. Lucky us! 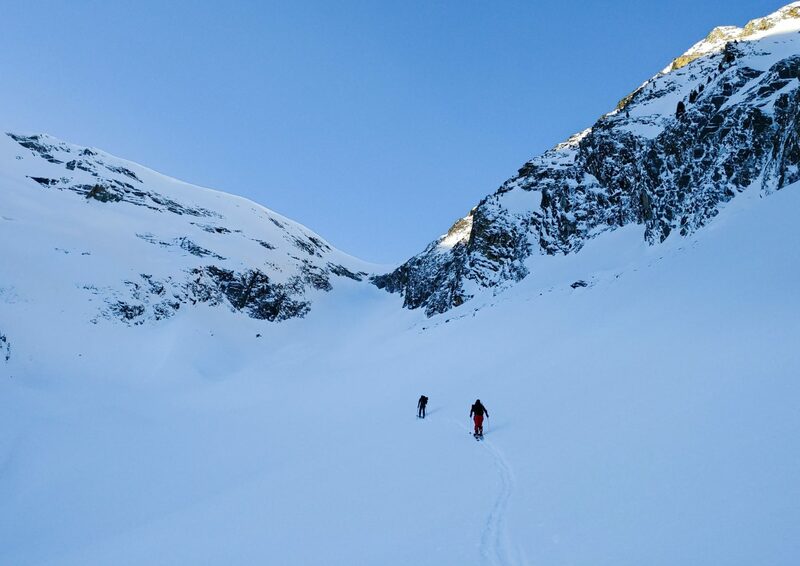 With renewed confidence, we ascended the col’s 55-degree couloir, ice axe in hand. 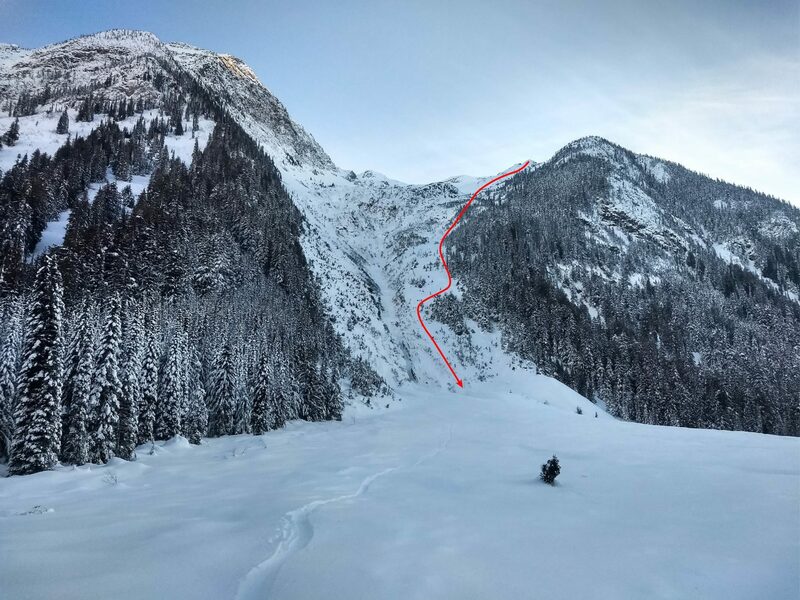 Inuk’s big-wall climbing expertise clearly paid off as he carved a winding path up the chute. He staggered a few times as the thin layer of sugary snow gave way to his featherweight. The sunlight blinded us as we scrambled over the top of the pass, thawing our frosty man-beards. 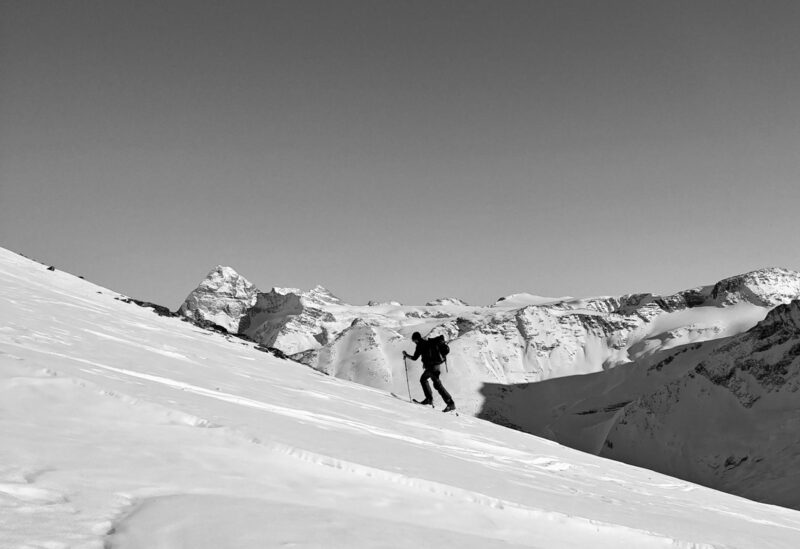 After hours spent in the dark depth, it is one of the most satisfying feelings in the world of ski mountaineering. Exhausted from the grueling climb, we collapse on a rocky outcrop, gazing at the endless sea of peaks. 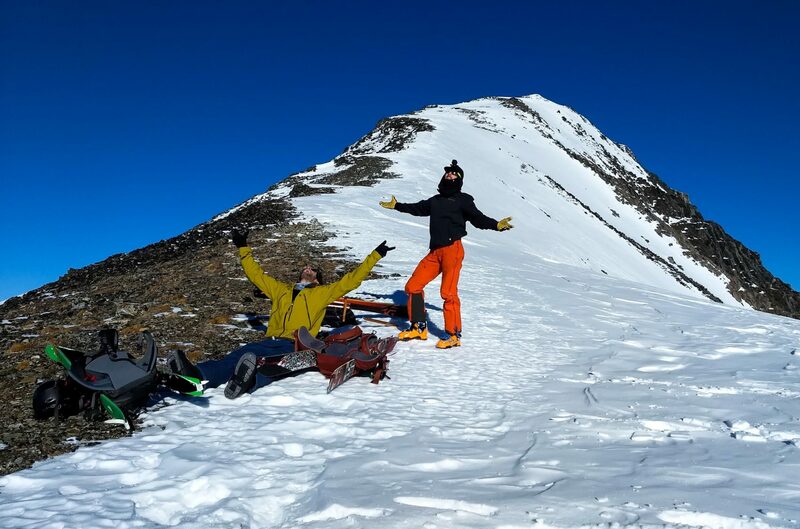 Once we quenched our thirst with some electrolyte-infused mountain brew, we proceeded up the crusty ridge, battered by the previous storm’s winds. 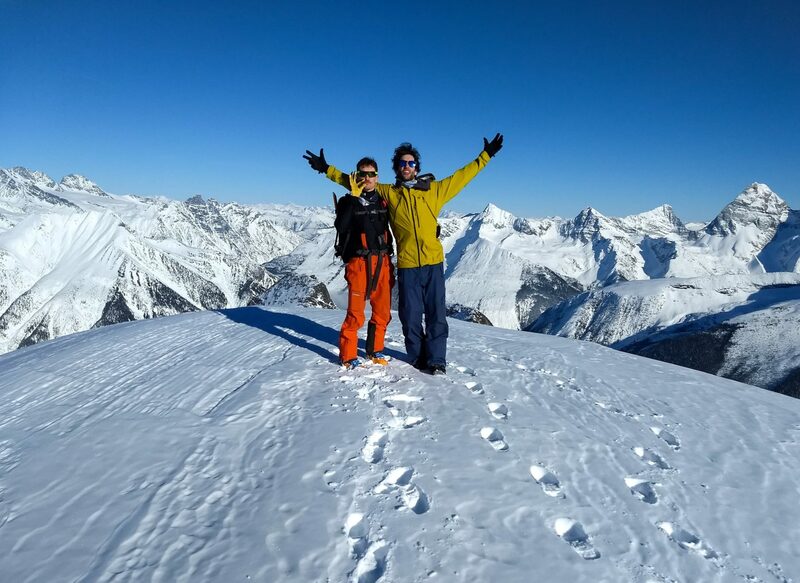 After 5 hours, 1750 vertical meters and a 8.5km tour, we bagged the peak. The 360-degree view was jaw-dropping, recalling memories of my time spent climbing the French Alps’ mighty peaks. Laurent and Inuk victory danced to a tune while I video-called my dad. We spent an hour at the peak, soaking up the sun and drinking hot chocolate from Laurent’s thermos. Now, time to shred Ross Peak Path! 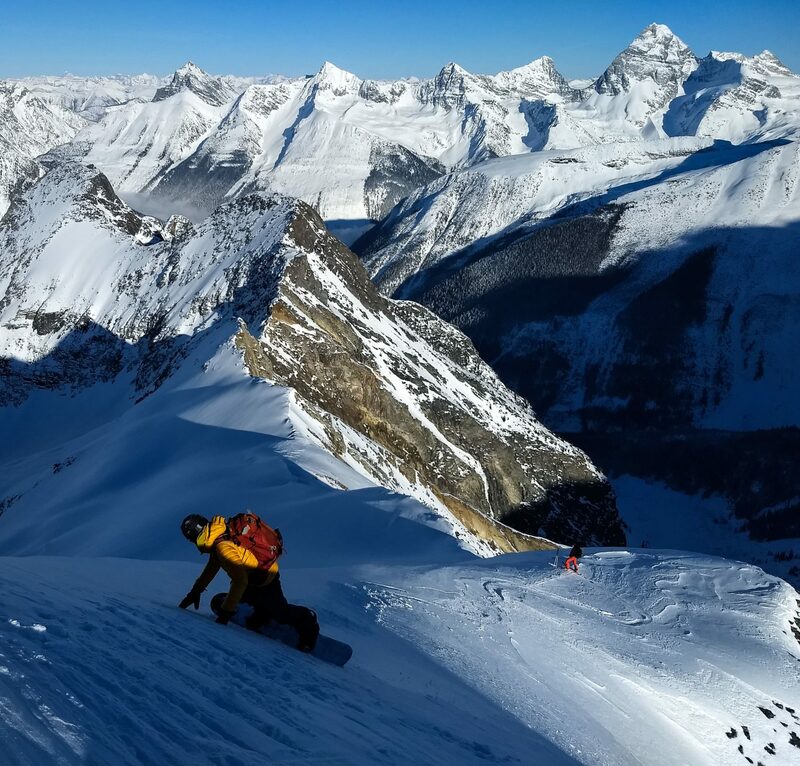 After studying the convoluted terrain far below, Inuk and Laurent shimmied down the eastern ridge to avoid jumping the colossal cornices. 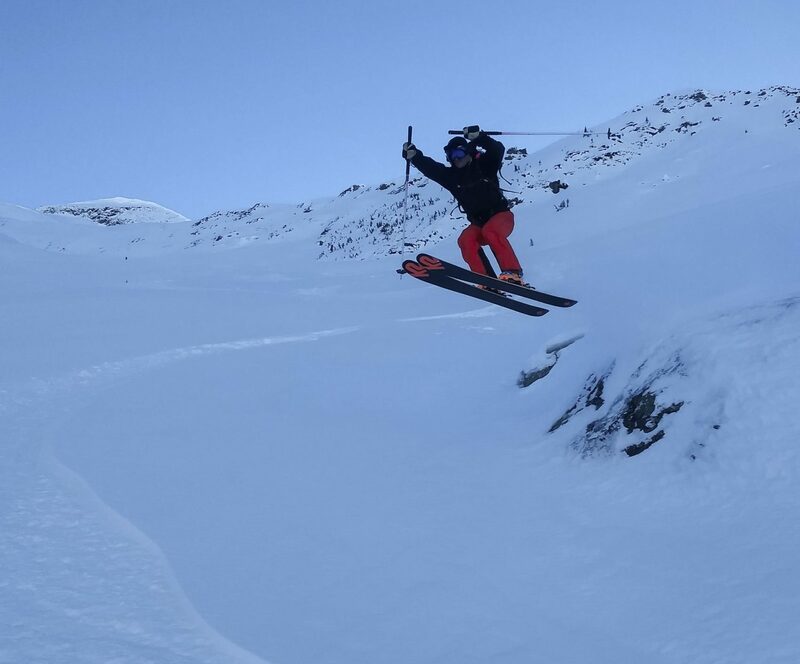 I felt right at home carving a few turns down the wind-swept face. 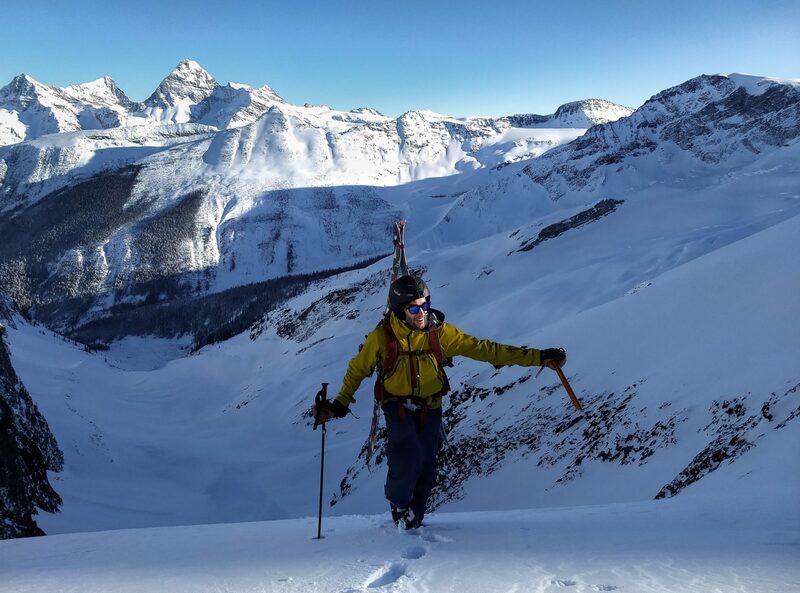 We traversed under an intimidating cornice, searching for a safe way down a cliff band. The clock was ticking. We had to find a solution fast. After a few harrowing minutes, Inuk located a “break” in the cliff. It was more like a rocky face with some sparse patches of snow. In a classic Inuk fashion, he launched off its apex, landing a hair left of a concealed rock. Laurent and I wouldn’t risk it and downclimbed in loose snow that provided little to no footing. Halfway down the face, we couldn’t proceed further. 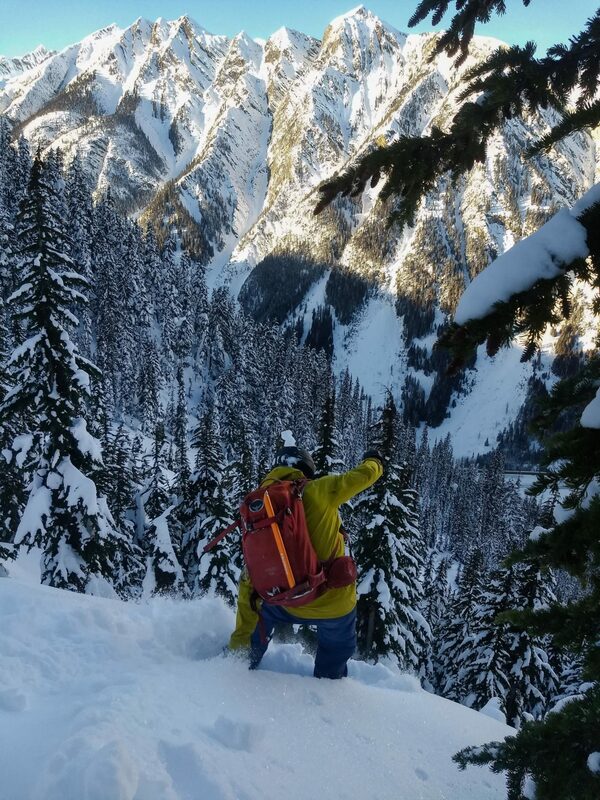 We threw our packs in the snow below and leaped off a precarious ledge. 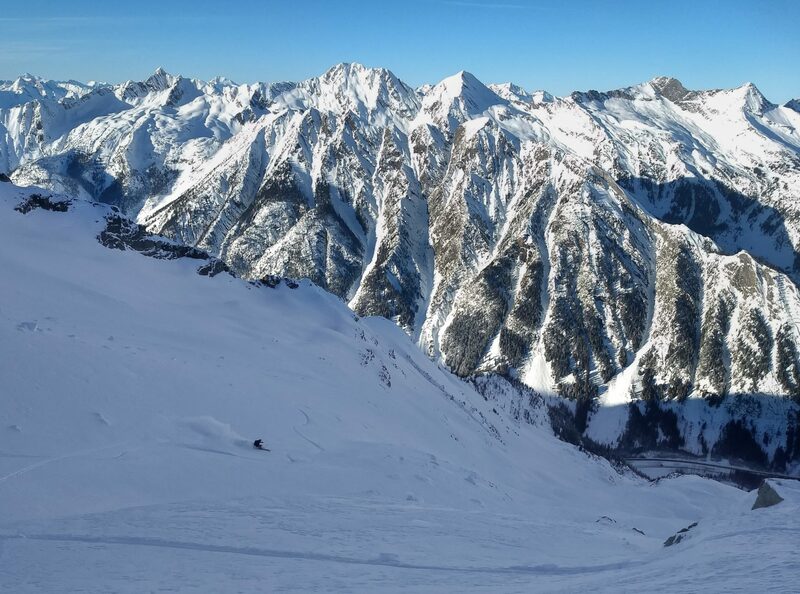 From our high perch, we could see the wide-open alpine bowl as well as the highway below. 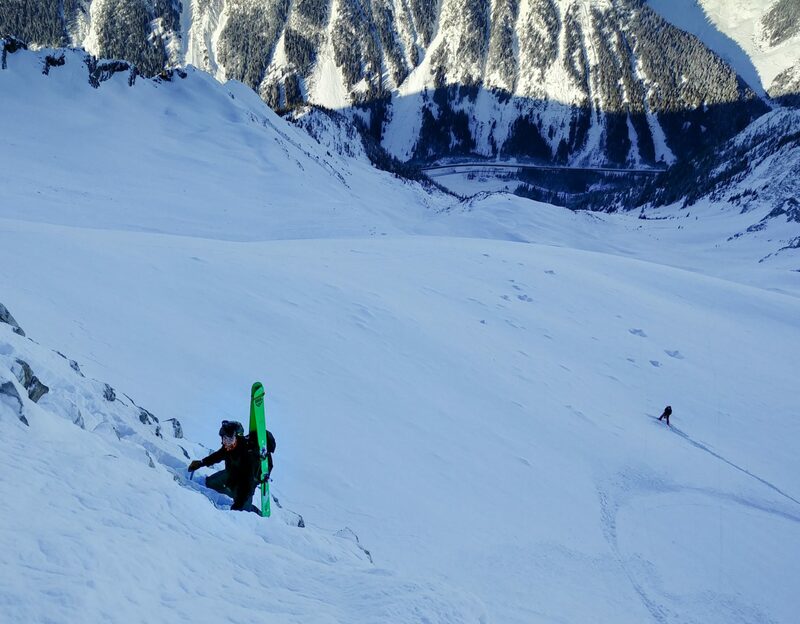 Eager to get back on our skis, we raced downslope. My sharp edges sliced effortlessly through a mix of hoar snow and glacial blue ice. I could pick up the soothing clicking akin to that of a rattlesnake as my planks stirred the sugary snow. Once we reached the forested elevation, Laurent, our tight tree navigator, led the way. 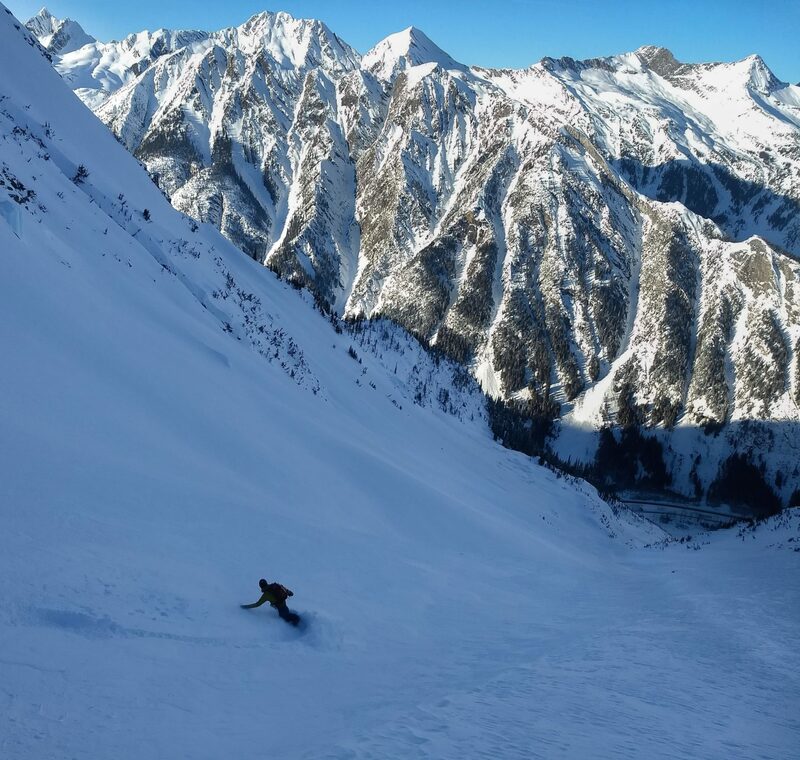 Our quads were burning after skiing 1700 vertical meters of pure backcountry bliss. 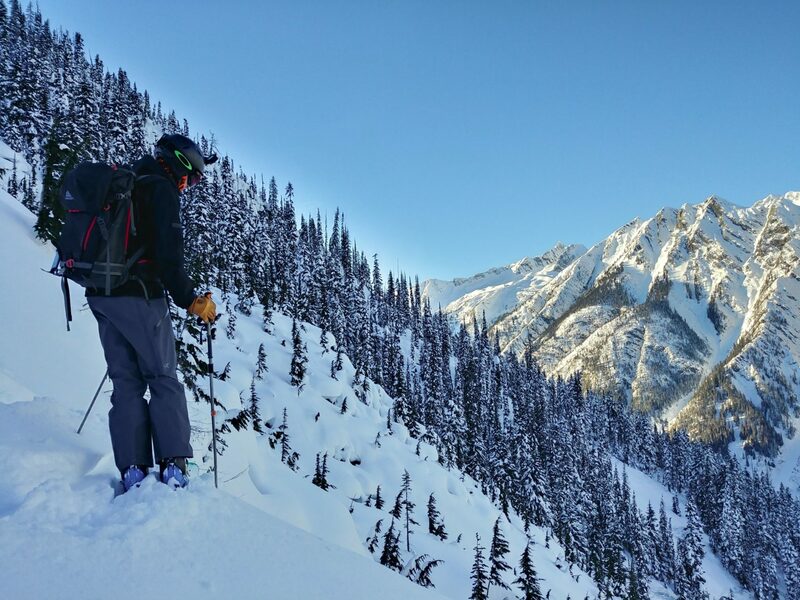 A top-to-bottom run at Revelstoke Mountain Resort for comparison. 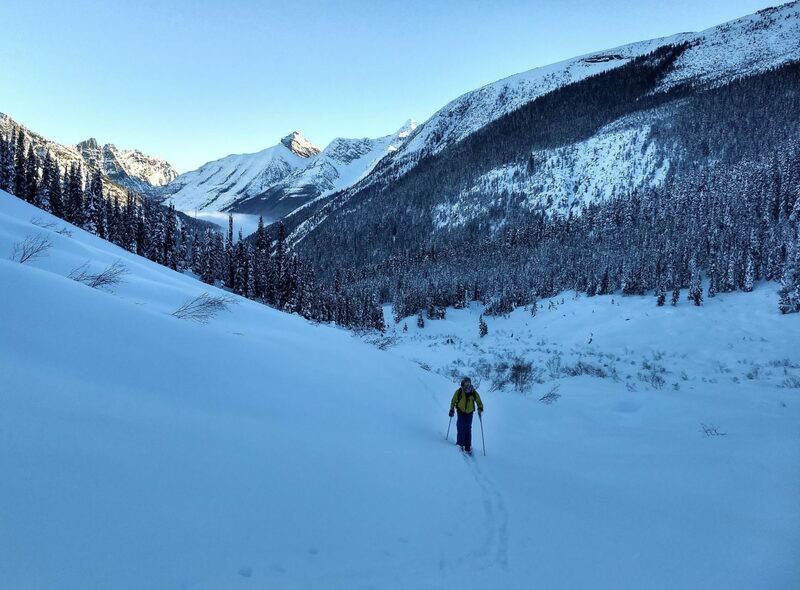 As the sun hid behind the imposing mountains, we entered a large snowfield leading up to the designated exit route. Looking back upon Mt Green’s north face, we could barely make out our tracks. 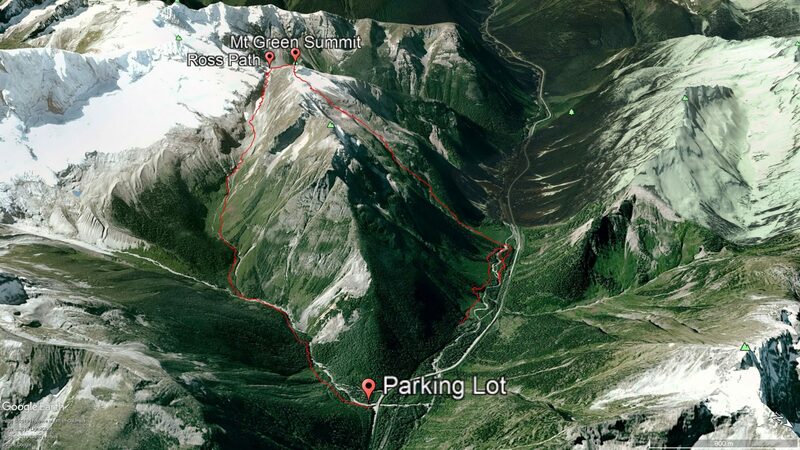 We completed the 3km slog back to the parking lot as the dimming alpenglow gave way to a waxing gibbous moon. Laurent and I were admiring the beauty of Glacier National Park while Inuk was dreaming of devouring poutine (fries, gravy and cheese curds). To each his own! We made it back to the car at 4:45 PM. Exhausted, wet and hungry, we slumped into our seats and drove back to Revelstoke, just in time for Nico’s delicious poutine. 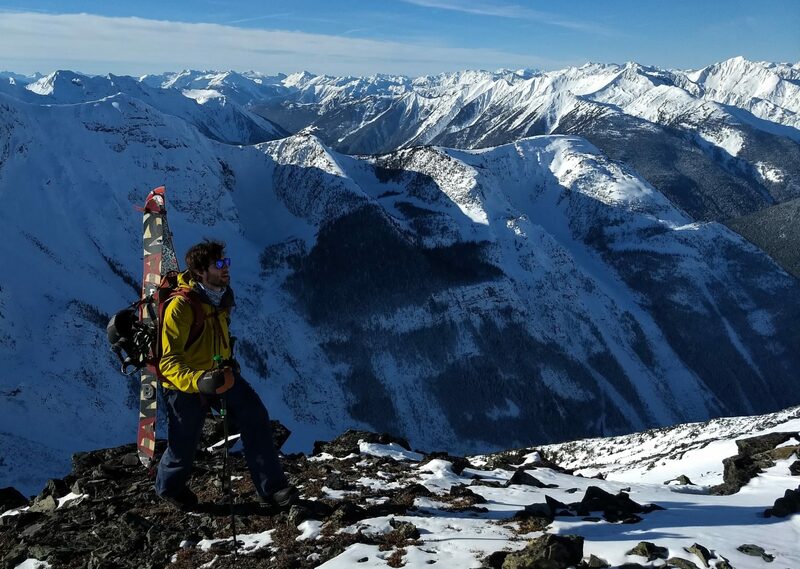 Engineering graduate gone rogue in favor of big mountains, steep aspects, and bottomless snow. 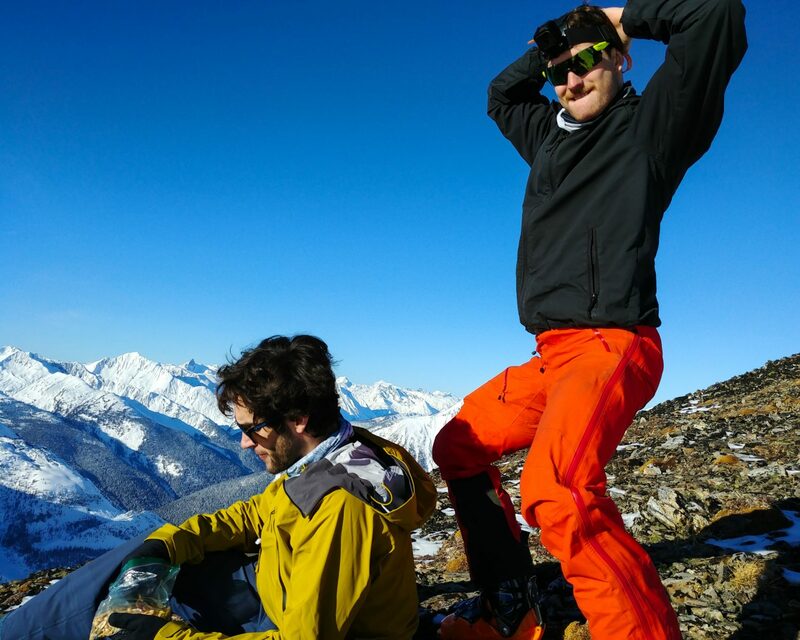 Ski touring fanatic, professional youtube mechanic, hopeless gear hoarder.